Abbas asks UN to take first step to flood Israel with foreign Arabs by suggesting Syrian “refugees” move to the PA.
Palestinian Authority Chairman Mahmoud Abbas is asking the UN to take the first step towards flooding Israel with foreign Arabs by suggesting Syrian “refugees” move to the PA.
Abbas’ request to United Nations Secretary General Ban Ki-moon, was reported by the official Palestinian Authority website Wednesday. The PA’s WAFA website said that there are 450,000 “Palestinian refugees” in Syria in 10 villages. The largest is Yarmouk, where Syrian President Bashar Assad’s forces attacked in the past week and killed more than two dozen people. Like other “refugee camps,” terrorists have established a powerful position in Yarmouk. If Israel were to balk at allowing them to cross from Syria, the international community would likely accuse the government of being cold-hearted. Abbas’ actual intentions more likely are using the Syrian Arab refugees as a the first wedge in long-standing demand that more than 5 million foreign Arabs be allowed into all of Israel and not just in Gaza, Judea and Samaria. The Arabs in question are descendants of approximately 750,000 who fled Israel or left of their own accord during wars in which their leaders and neighboring Arab countries promised the Arabs they would be able to return to Israel in a short period of time after the anticipated annihilation of the Jewish state. 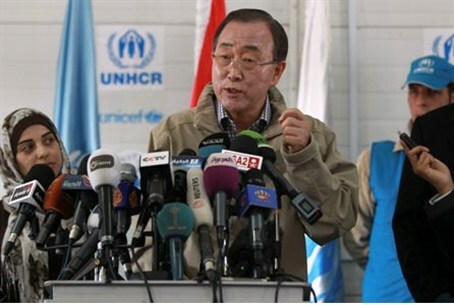 The United Nations does not designate any second or third generation as a “refugee” except for the Arabs. In all other cases, those who flee their home countries are classified as refugees, but their children and future generations are considered citizens of the countries where they live. The special distinction for Arab “refugees” leaves a time bomb on the diplomatic table, as their numbers have grown exponentially, most of them never having seen Israel. Virtually all sectors of Israeli society, including most leftists, oppose opening the gates to immigration of foreign Arabs, which would end Israel as a Jewish state regardless of whether the Palestinian Authority can establish itself as an independent country. The foreign countries hosting the Arab descendants have refused to grant them citizenship, except for a small number, provoking a situation of poverty and inequality that has provided a breeding ground for Muslim terrorists. The descendants of the more than 800,000 Jewish refugees forced to leave Arab countries after the establishment of Israel, are integrated into Israeli society.